We should not be surprised when the world hates us for our convictions—for our faith in God. When we follow the will of the one whom the world is inclined to willfully resist, why would it be in the least bit astonishing that people would dislike those who obey him. Daniel does not report any sign of amazement on the part of Shadrach, Meshach, and Abednego, as they were being thrown into the furnace. It seems as if they expected this sort of treatment from the king. Our instinct is to cry out to God for miraculous intervention. Yet Shadrach, Meshach, and Abednego left matters to the will of God. And notice their condition, who were first bound and then thrown into the fiery furnace. 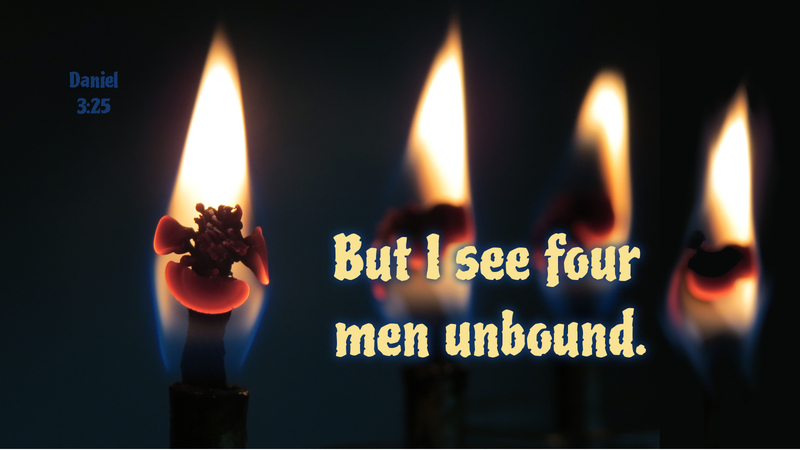 When King Nebuchadnezzar looked, he not only saw that the men were unscathed, they were now unbound and a fourth person stood with them in the flames. When we face tribulation, may we be content with the will of God for us, at peace because we are freed from sin, death, and the devil—and joyful that one stands with us in our time of trial. Prayer: Father, be greater in me than my own heart, and give me the peace of Christ. Amen.